How should my charity approach employee recognition? When it comes to employee recognition, I can’t emphasise enough the importance of tailoring a solution specific to your organisation and charities face some unique challenges in this respect. For most organisations, employee recognition is about ensuring that they are celebrating their employees’ achievements in order to motivate and engage staff, however this can mean very different things in the third sector and can even vary significantly depending on what sort of charitable organisation you are. What type of charity are you? Take for example a charity that exists to raise money for a specific cause and relies heavily on volunteers working in high street shops or, indeed, working directly with recipients of that charity. 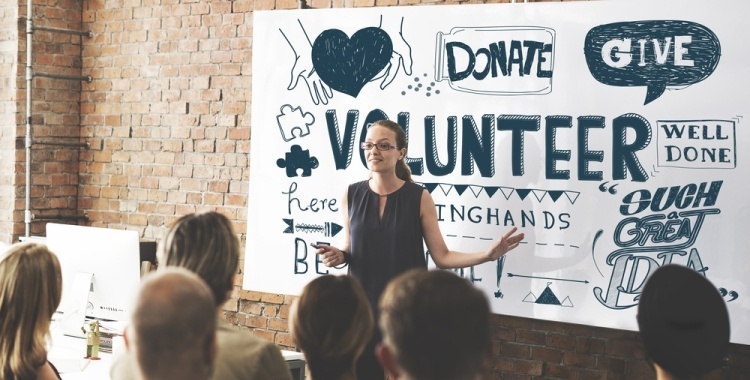 Those volunteers are motivated to do so not necessarily by financial reasons, career progression or, indeed, recognition from colleagues and managers, but because they wholeheartedly believe in the cause of the charity. On the other hand, what about a scientific research organisation with charitable status? It’s highly likely that individual researchers are not even directly employed by the charity in question, it just happens to be the best place for their research because of its facilities, funding grants, links to academic institutions, etc. Moreover, these will be highly motivated, passionate scientists for whom recognition is more about having work published in a major journal, or making a major scientific breakthrough, than it is about having colleagues in another team member nominate them to receive a financial reward or day out with the kids. What makes your team tick? It’s also worth considering the money factor. At any charitable organisation, more so than in business, every pound counts. Funding is often heavily reliant on donations and as a result finances are heavily scrutinised, including money spent on staff. Think carefully about the types of employee recognition and rewards you are giving. Focus less on financial awards and more so on their individual motivations. Non-financial ‘thank-yous’ (e.g. cards, certificates, balloons, team announcements) with a social recognition element (celebrating success across the organisation via online 'thank you message walls') can make a huge difference to volunteer groups who have spent their time raising funds or running projects. Forge stronger links between your overall organisational success and their individual achievements. Be innovative. How about making a contribution to the charity in their name? Introduce a league table for ‘shop of the month’ whereby the winner is awarded points that can be cashed in for charitable donations. Consider the use of ‘work-related awards’. They can be a great way to add a little something special your colleagues' work day that won’t cost the charity any money and can be tailored to each organisation’s culture and office experience. Examples include: ‘parking space for a month’ (usually reserved for directors); vouchers to jump the canteen queue; the option to come in late or go home early one evening; additional time granted for lunch; lunch with the CEO or with the charity’s celebrity backers; or a role in the charity’s next TV or advertising campaign. If working with scientists/researchers, get to know which awards mean the most to them and see what role you can play in supporting that. Also, behind every research team (that’s driven by research success and publication) is an administrative support team and it’s important to think of ways to make them also feel a part of research success. Consider creating different channels for research teams to thank their oft-forgotten admin/support colleagues. Download our guide to developing an effective employee recognition strategy today.